I will have dozens of sculptures and drawings in a solo exhibition of my work at the University of Evansville’s Melvin Peterson Gallery from January 14th to February 23rd. Come see the work! If you’d like to come for the opening reception and gallery lecture, the details are here. 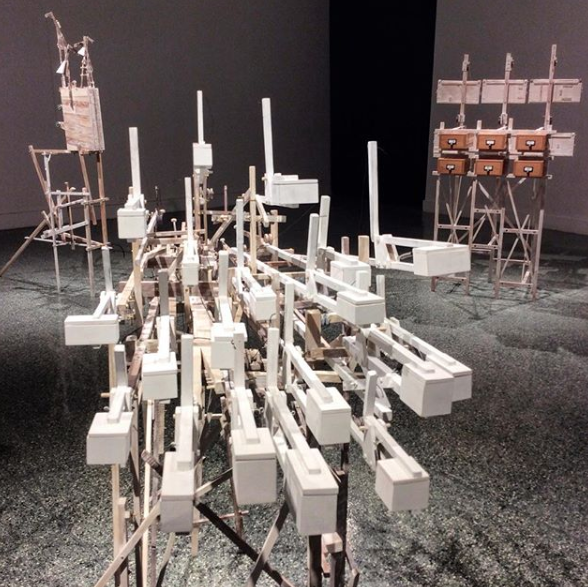 Transformation 10: Contemporary Works in Found Materials is up through March! Friends! If you’re traveling near or through Pittsburgh, PA in the next few months, it’s not too late to see my piece, The Seeing Machine, in person at Contemporary Craft! It’s one of several really lovely new works by an amazing group of artists in the show, and I’m super duper proud to be included. For more information on the show visit the Contemporary Craft website. The fine folks at IU did a little video interview of me talking about work in the faculty show. Check it out on their website! 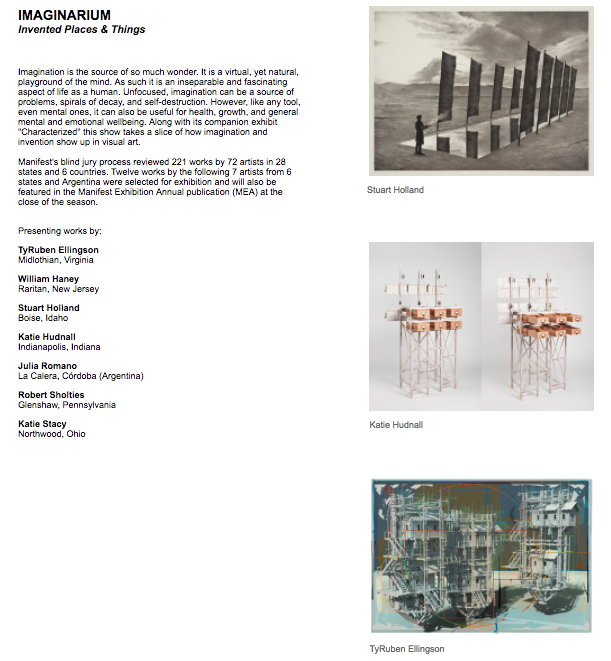 If you happen to be in Bloomington Indiana this summer, stop by IU and check out the On Structure exhibition at their Grunwald Gallery. I have 4 pieces in this lovely group exhibition curated by Linda Tien and on view through July. The other artists are Hannah Barnes, Jessica Calderwood, Tiffany Carbonneau, Brian Harper, Mie Kongo and Brooke Marks-Swanson. For more information hit up their gallery site here. 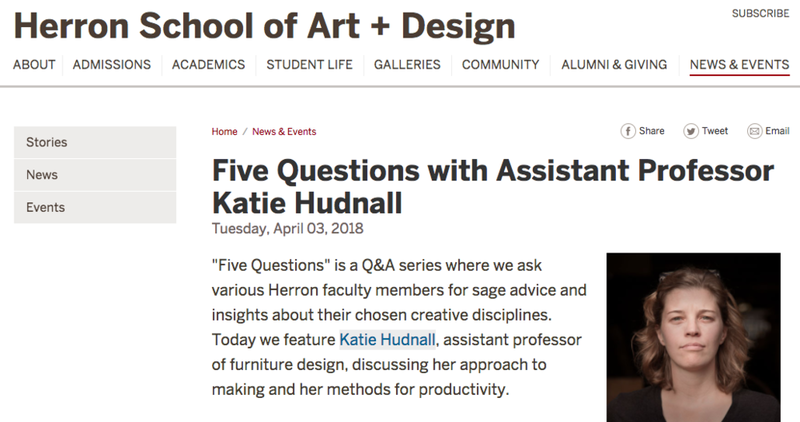 The amazing External Affairs staff at Herron School of Art and Design asked me if I would answer some questions for a new series they're doing profiling Herron faculty. Check out my answers here. If you have time, you should also read the first one about Lowell Isaac, one of our amazing teachers in Illustration - my colleagues are so cool! 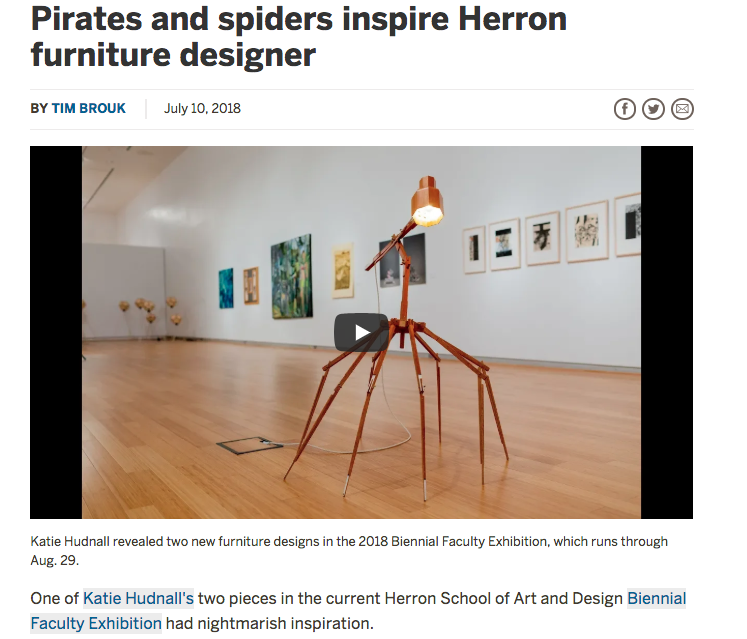 Heck, you should probably just keep an eye on EVERYTHING going on at Herron - it's a great place to work, and a great place to go to school! I'm kicking off 2018 with work in 3 different group exhibitions in Evansville, IN, Athens, OH, and Cincinnati, OH - if you live near one of those cities, go check out the work and see a lot of other amazing artists while you're at it! The Chair, Writ Small was curated by Robert Millard-Mendez and will be on view at the Pace Galleries down in Evansville, IN at Southern Indiana University through Feb 19th. OH+5 is on view at the Dairy Barn Art Center in Athens, OH through mid March, and features a lot of great work from regional artists. Imaginarium opens THIS THURSDAY (January 25) at Manifest Gallery in Cincinnati, OH and will be on view through February 23rd. I have TWO pieces in the show - come visit during the opening events and I will show you how they work! Friends! 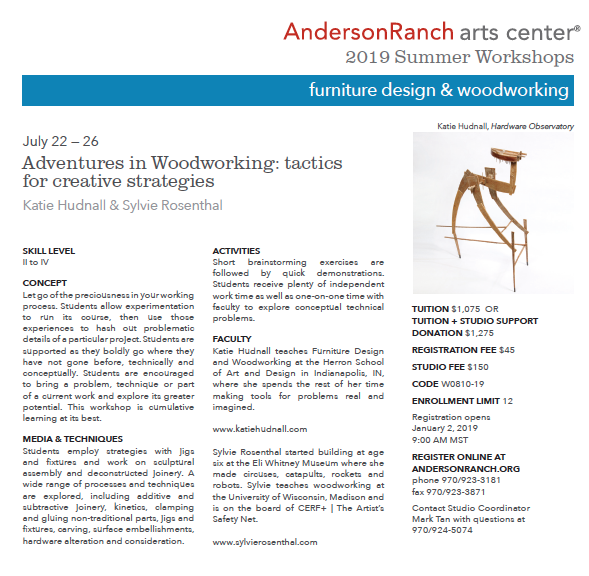 I am teaching a workshop this summer at the beautiful Anderson Ranch in Colorado called, "Blurring the Lines" which will be all about crossing and crisscrossing the line between furniture and sculpture. Come play! For more info visit Anderson Ranch's Website. 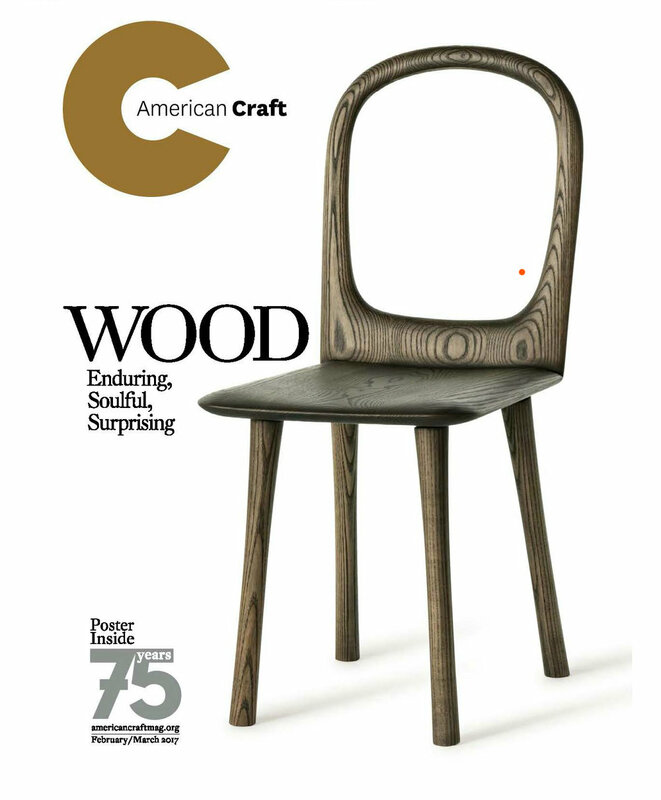 I am honored and delighted to have an article about my work in the Feb/March issue of American Craft Magazine. Many thanks to the folks who work at ACC, as well as Deborah Bishop for a lovely conversation and fantastic writing, and Harold Lee Miller for taking some amazing pictures of me in my space. I was delighted to be a part of this lovely, traveling exhibition featuring a number of remarkable artists. I collaborated with Amy Forsyth - we sent each other "seeds" of inspiration and each built a cabinet addressing our responses to the other's lovely, small, three dimensional sketches. Be sure to visit the Fuller Craft Museum in Brockton, MA and check out all of the remarkable work. Can't make it? 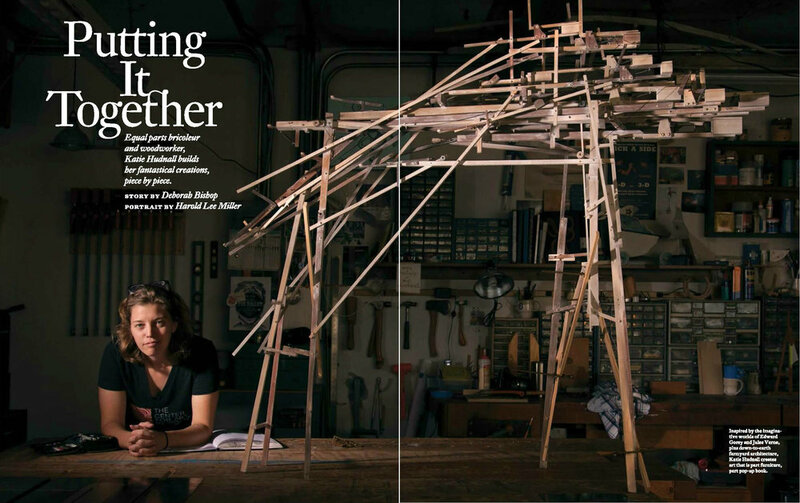 The folks at the Center for Art in Wood put together a wonderful catalog. You can buy a copy here: https://centerforartinwood.org/product/bartrams-boxes-remix/ If you want to know more about the Fuller Craft Museum or the Bartram's exhibition, follow this link: Fuller Craft Museum. Delighted to have a solo exhibition at the South Bend Museum of Art! Reception and artist talk will be March 3rd, 2017. Please join me! My fellow Windgate ITE Residents and I will be giving a presentation at this year's Furniture Society Conference (full disclosure, I'm on the Board of Trustees for the FS, but this marvelous plan was cooked up and implemented by one of the other residents). The presentation takes place on Thursday, June 23rd, from 4 - 5pm and is called, "Seven at the Center: the 2016 ITE Windgate Residents Collaboration Laboratory Presentation." If you're in Philadelphia and interested in furniture, art, incredible makers and thinkers who love sharing their work with others AND know how to have a good time, I recommend checking out the whole conference schedule - it's not too late to register! Go to http://furnsoc.org/inspiration/annual-conferences/fs16/ for more information, and maybe I'll see you there. Delighted to have a drawing in the current exhibition up at Coop Gallery in Nashville. http://www.coopgallery.org If you're in the area, check it out, it's up through June 26th! !